Wade's Barber Shop, business of Mr. Wade Walton, an internationally known Mississippi Delta Blues musician who lived in Clarksdale, Mississippi most of his life. 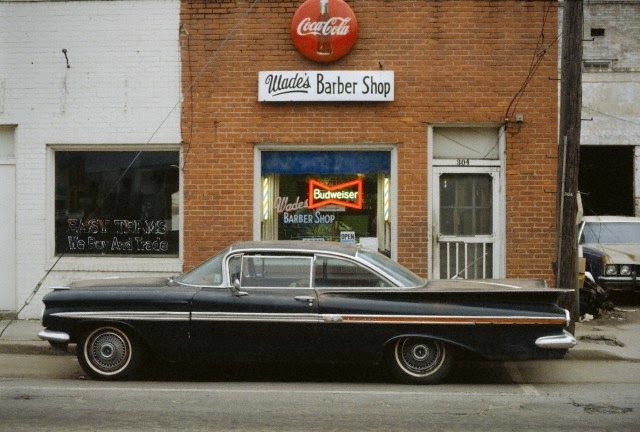 A 1959 Chevrolet Impala automobile was usually parked in front of the shop. Born on a plantation in 1923 as one of 17 children, his day job for 55 years was as a barber and in in 1972 he opened Wade's Barber Shop "cutting hair and slapping out the blues and rhythm. ".